Eh, This Guy Doesn’t Belong… In the first Thor movie, I was introduced to a character named Hawkeye. 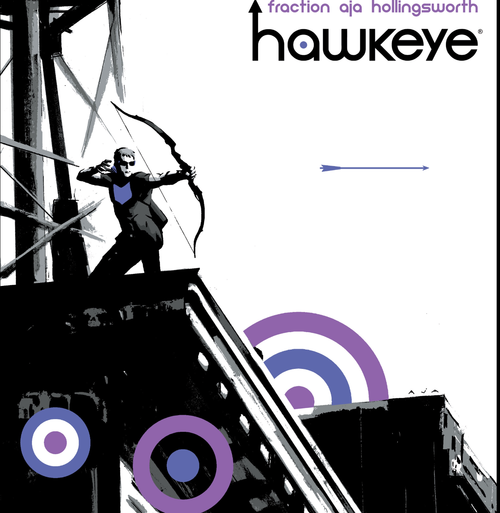 Now I had heard of Hawkeye before, but had no clue who he was outside of a purple archer. After seeing him in Thor, I had no compulsion to learn more about this character. Then Avengers came out. He seemed pretty cool, but he just didn’t seem to fit in with a team who had super powered beings, amazingly smart scientists, and a god. Plus he was shooting arrows in a world where we have pulse cannons. I just kept thinking; what if he ran out of arrows? He had a few moments of cinematic awesomeness, but overall I couldn’t really care less about a purple archer. I was at Heroes’ Con this year with my co-host Jeremy and he pointed out a guy named Matt Fraction. He said that Fraction was one of the hottest things that Marvel had going at the moment. I made a mental note to check this out, but nothing more. 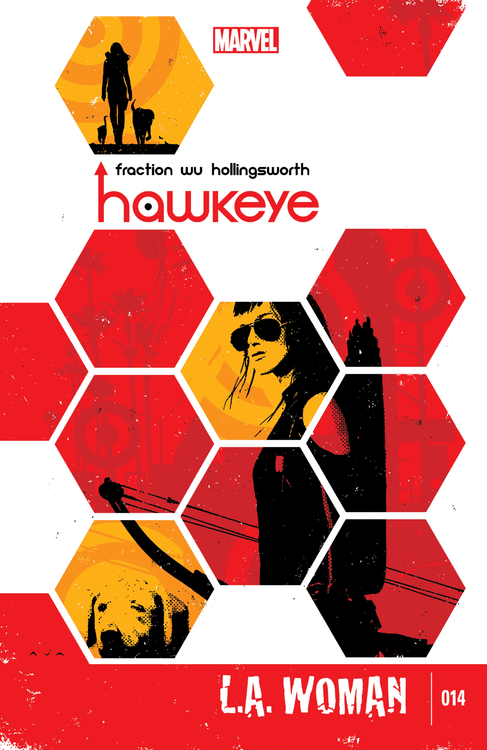 I then heard some rumblings thru the podcasts that I listen to that Fraction’s Hawkeye run was an absolute must read. I’d heard in particular that there was an issue that dealt with Hurricane Sandy that was one of the best single issues of the year in any comic series. The websites I check in with gave this Fraction guy’s work very high reviews, but I couldn’t get past the powerless purple archer! In an effort to broaden my horizons and not just read DC titles, I decided to pick up some Hawkeye issues. 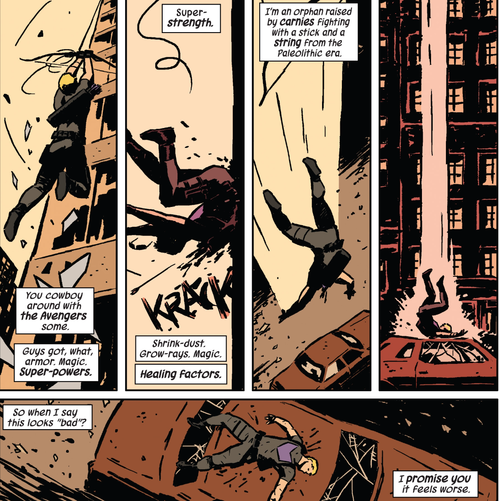 I’ve only read the first three issues of Hawkeye, but I felt compelled to share my thoughts. I have not been this excited for a comic in a long time. It all starts with the covers. I’ve taken a gander at all of them and I just think they are some of the most creative covers I have ever seen. Extremely retro, minimalist, colorful, and unforgettable. Francavilla even does a few of them, a person of whom I have previously expressed my admiration for. It sets the tone for the book, and that tone is outstanding. 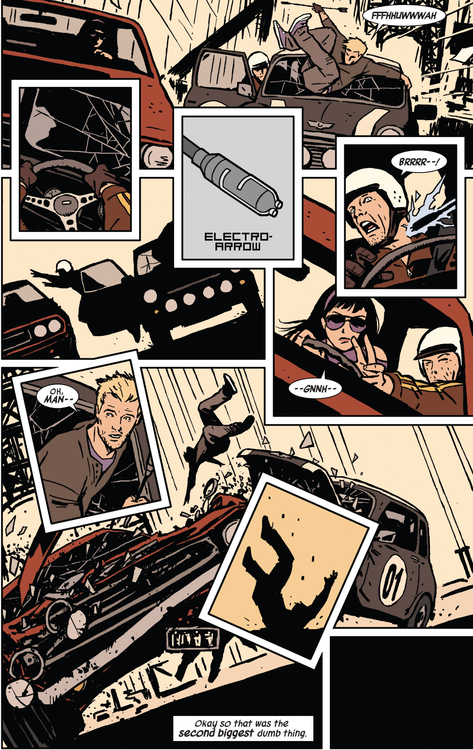 The first few issues I have read are drawn by David Aja and colored by Matt Hollingsworth. The first few pages confused me with the art and style. It didn’t seem like something I would enjoy at all, as I’m usually quite picky with my renderings. The drawings looked like someone had taken the background characters from lesser talented artists and made them the focal point of the book. Then it clicked. This art helped differentiate the book from all the others I was reading. It was instantly memorable. 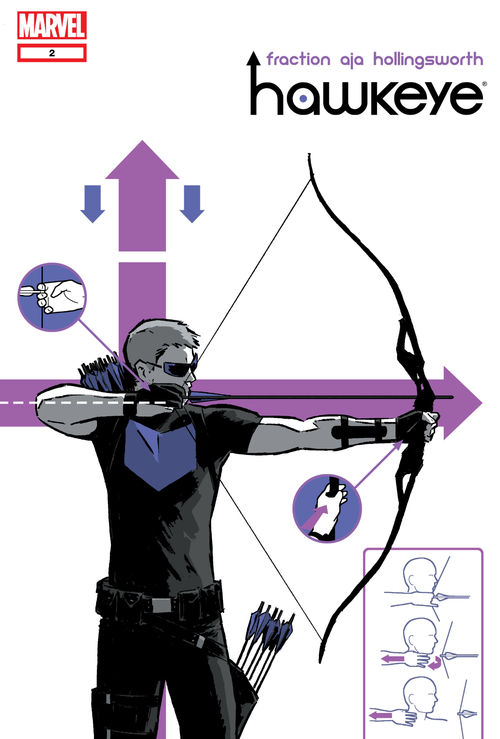 When I thought of Hawkeye, I could easily place the art in my head. Now I cannot imagine reading this series with anyone else’s pencils. Each page has so much put into it, so much personality. The panels are arranged in very nontraditional, but creative way. The action sequences are handled extremely well and are a joy to read. 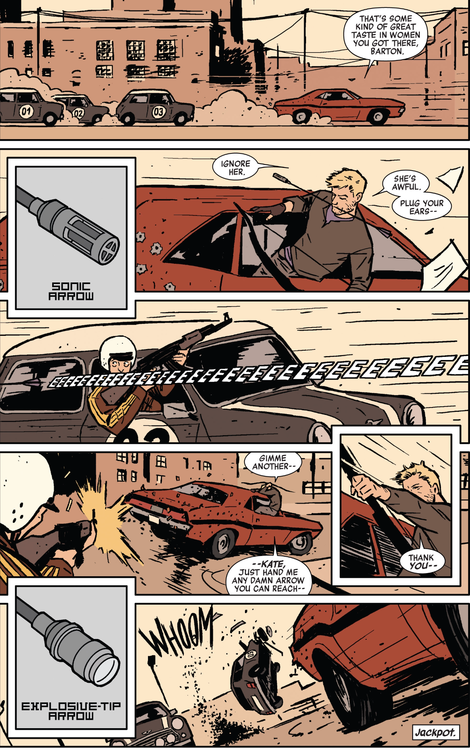 There is an amazing car chase that happens in issue three that really gets the heart going. The use of the panels here in particular is superb. And purple. There is so much purple everywhere. You would think this may be a negative but it only adds to the comic in my opinion. They took an identifier of the character someone like me was weary of and made it a great strength. For a comic to be great, it has to be running on all cylinders. Here the art and the story perfectly complement one another. The story is every bit as impressive as the art. What I enjoy most about these stories so is that they aren’t doing a long arc. You can jump in to any issue and not be lost. They are still connected with a self-contained continuity of course, but each issue is its own adventure. Fantastic one-shots. They are small scale stories that focus on Clint the man, not necessarily Hawkeye, and definitely not the Avenger. For example, the first issue deals with Clint cleaning out corrupt mobsters and saving a dog. 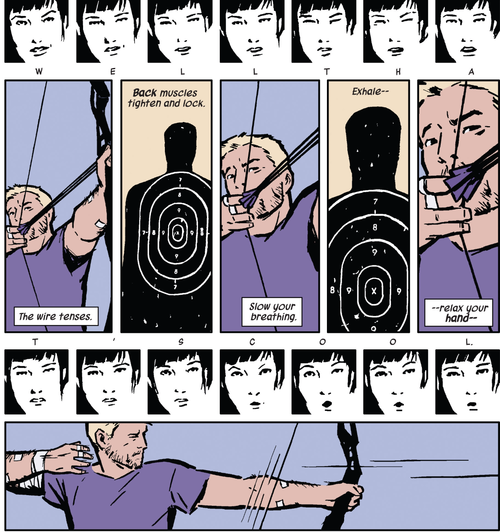 The second issue introduces a friend named Kate Bishop, who apparently was also once Hawkeye. I love their back and forth. She is very talented in her own right and ends up saving Clint at the end. The third issue has been the best so far. In it he chronicles the dumb things he has done that day. This is the issue I was previously talking about with the fantastic car chase scene. 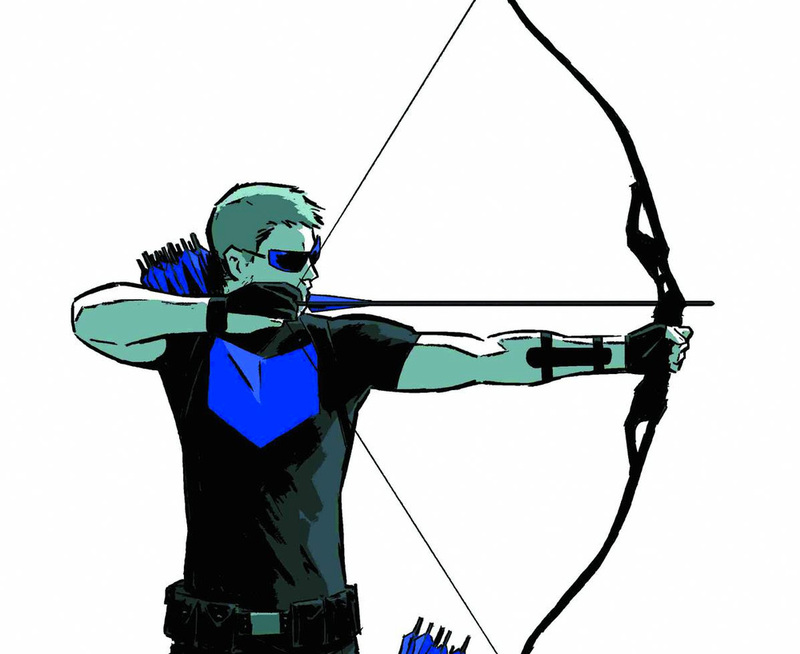 Clint hasn’t labeled his trick arrows, so he just shoots at the baddies in hopes that he has chosen the right arrow. Even though it is something quite simple, this brings a great deal of comedy. 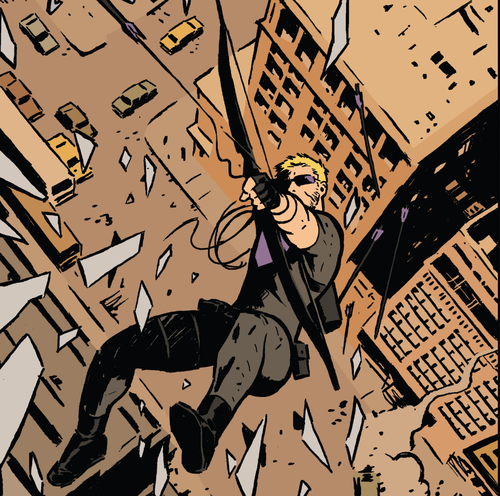 There is also a panel that I won’t include that literally has Clint caught with his pants down in a fight for his life. Hilarity ensues. That is another thing about this book; it is very clever. Some of the observations Clint makes had me laughing for several pages. The pacing of the story is something that is different from other books. It isn’t linear in nature, it jumps around often leaving you wondering; how in the world did he get into this situation? I’ve always enjoyed this type of storytelling. This book is really amazing in every single way and is just plain fun. Currently this is all I want to read. If you have been holding back because this is a purple archer title, don’t. It is some great stuff!